This project Examination Management System has been developed on Java, JSP and MySQL Database. We will provide to student easy java projects with full source code and database of the project. The main purpose to develop this project was to taking the exam of students on computer science of different branches and subject. There are 3 types of users available in the project first is admin who is the Super Admin of the project, who can manage all the things of the project. Second is teacher who is responsible for adding the question branch and subject wise. 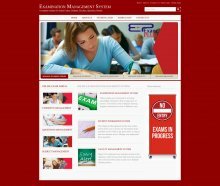 Today Examination Management system has become fast growing examination method because of its speed and accuracy. Examination Management System Project in Java is the simplest to use web-based application for schools, colleges, university, coaching classes, training centres, certification agencies, recruitment firms to conduct timer-based, completely automated paperless examinations. The major java project Examination Management System has modules like question bank, examination , test setup, giving examination, calculate results, view results, store test data, administrator module to manage examination, question and its options. Examination Management System is also needed less manpower to execute the examination. Today, almost all exams and recruitment tests are being conducted in online mode. Here students can get online java projects with source code free download.